One of the greatest joys of our garden transformation is the diversity and abundance of wildlife it has attracted to our home. Here in the San Francisco Bay Area, we are fortunate to be surrounded by beautiful hills and low mountains with lots of preserved open space. The wildlife trickles down into the urban and suburban areas, especially where the right habitat exists. 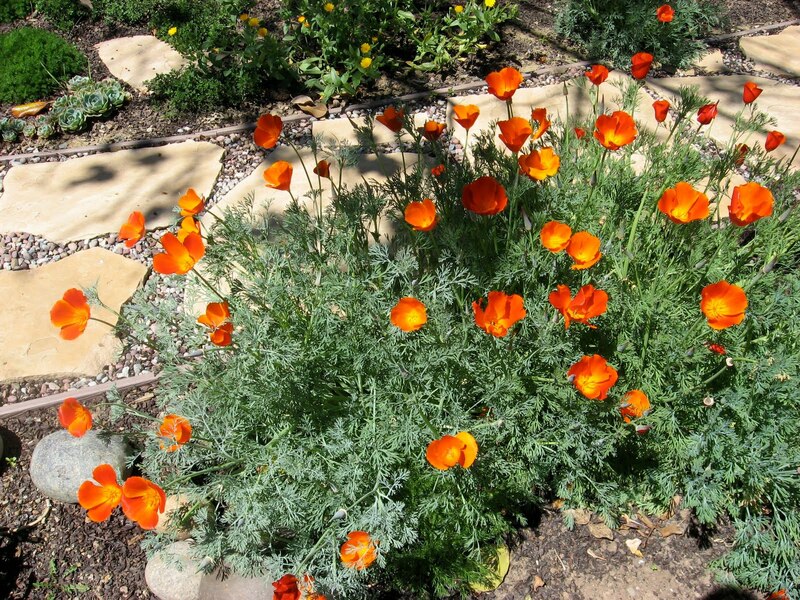 Growing plants native to our area is a sure invitation to the local fauna: different types of wild bees (plus honey bees), butterflies, many species of birds, lizards, and even salamanders. One of my special joys is the nesting pair of California Thrashers that moved in after we took out the lawn in the backyard. Bay Area residents all seem have their favorite stories about close encounters with raccoons, opossums, skunks. and deer (like the time we had a large fluffy raccoon walk into our house, and the possum living in our garage....). 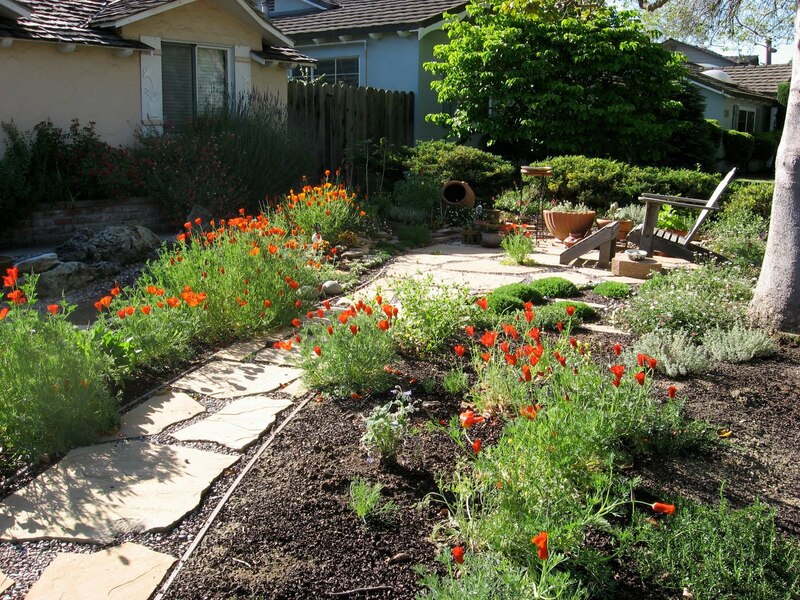 But for the gardener, there are sound arguments for nurturing a diverse garden, instead of a monoculture of lawns (assumes no harmful sprays or other such chemical measures are used). In our garden we are still in the process of bringing more natives in. 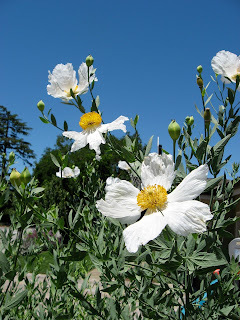 The flowers are often spectacular, as shown below (our Matilija poppy shoots flowers skyward ten feet high!) and many of them require very little water or special care, so those attributes are a big incentive. 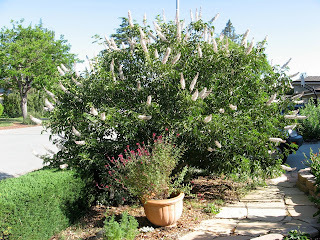 One of my new favorites we planted last year is a Fremontia bush, from the Los Altos Nursery. 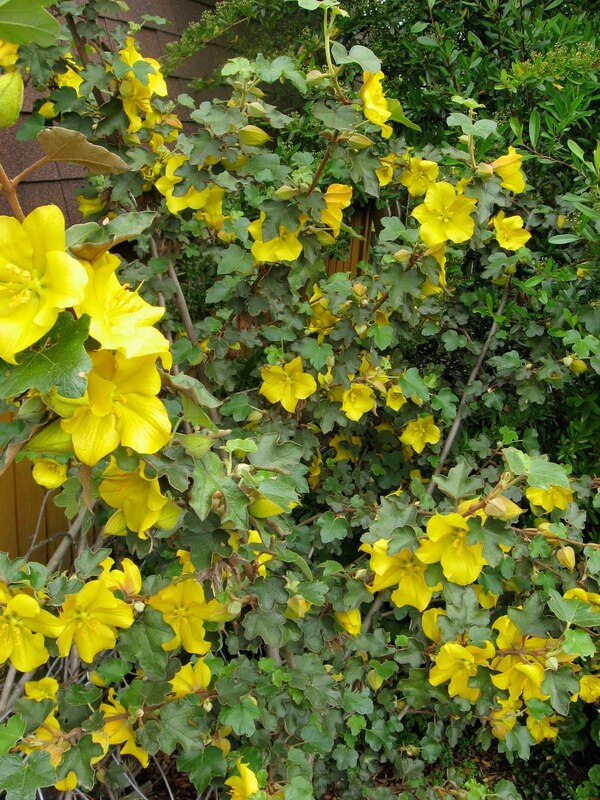 Here it is revving up with a profusion of lemon yellow blooms that last into the summer. The bumble and carpenter bees go nuts! The growing instructions are music to a Californian's ears: don't give extra water in the summer- you'll kill it. Of course for this young bush we gave some additional water last summer, we'll back off this summer. Another newcomer is the ceanothus, "Dark Star", from the Yerba Buena Nursery in Woodside (they sell only native California plants). 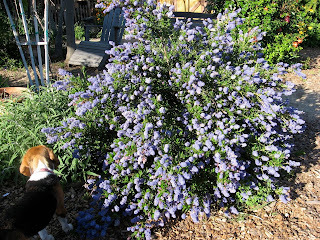 Here it is covered with blue flowers- a favorite of bees of different types. 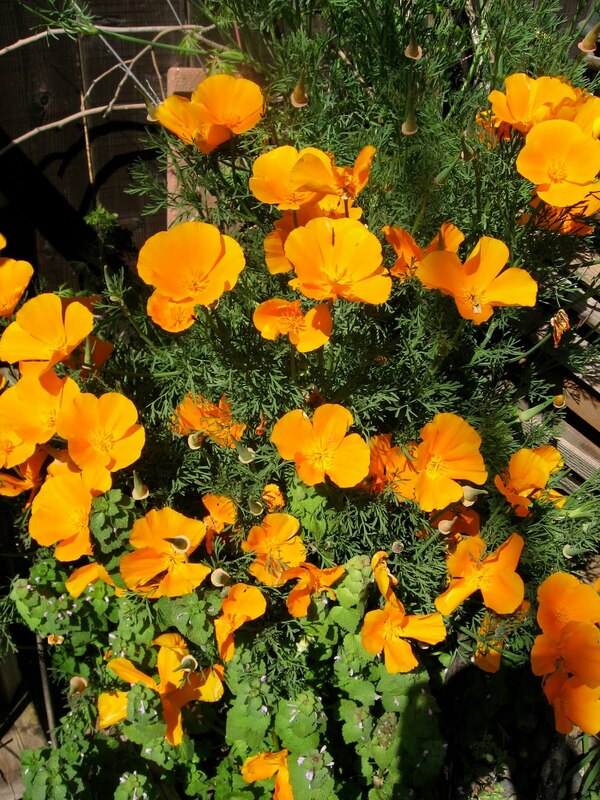 Our beautiful California poppies are a "must have". They seem to find their way into the garden on their own and they will reseed, but this year I bought some seeds to encourage them to spread. This photo shows our classic gold poppies from my backyard, but in my front yard I have yellow and red variants coming in, (sown from seed, below) truly lovely in the sunlight! I saw a pink variety in a garden recently for the first time; I'd love to get some of those. These wonderful reddish types have really taken to our front yard, much to my delight! The showy white flowers in spikes have a wonderful perfume. These trees bud out in February, and by late April-early May burst with flowers. 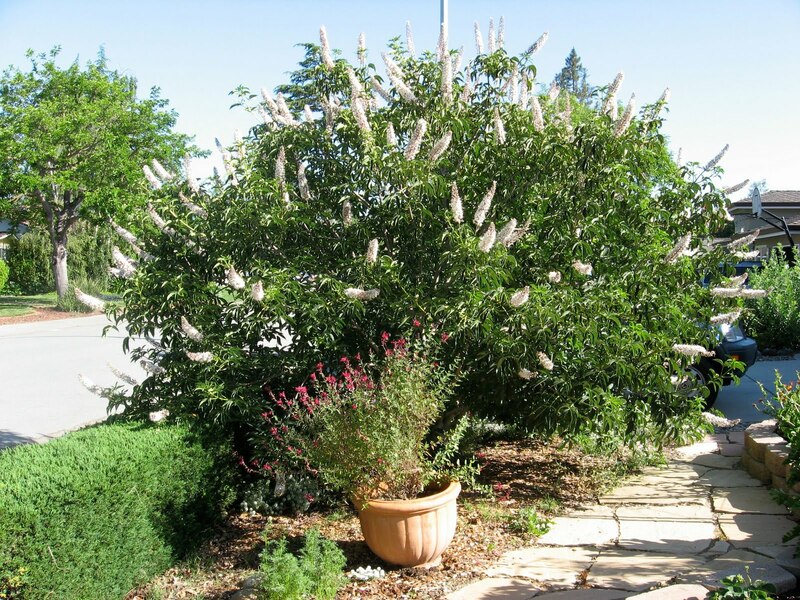 They lose their leaves early in the fall, and have beautifully graceful silvery branches for fall and winter. 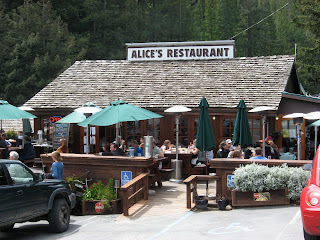 The food is good, it's surrounded by redwood trees and it's a mecca for the weekend biker crowd- a must! 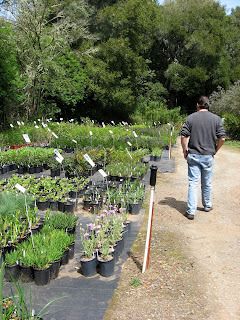 The nursery is south of the restaurant, so you take Skyline Blvd. south about a mile or more and look for their sign on the right. 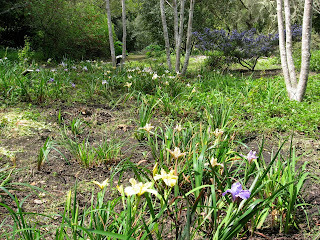 Then it's a good mile or two down the narrow road to reach the nursery. Besides the nursery offerings, they have a garden shop with lots of great books, items for the garden and gifts. 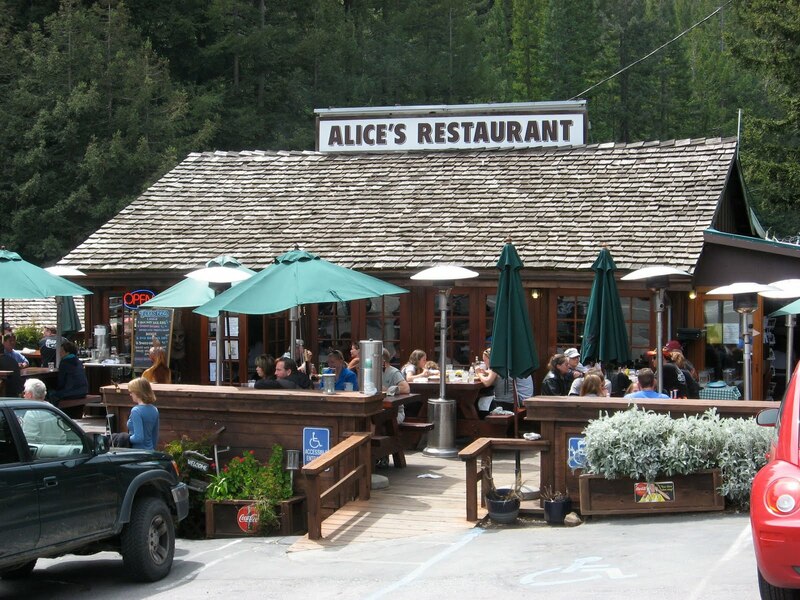 They also have a tea shop and host "Farmhouse Teas"on selected dates. 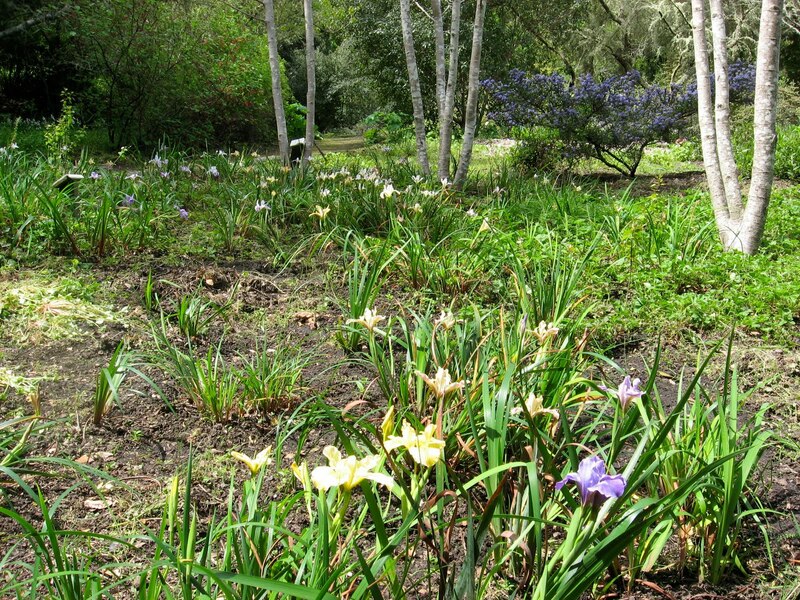 Above: Yerba Buena's extensive selection of California native plants. 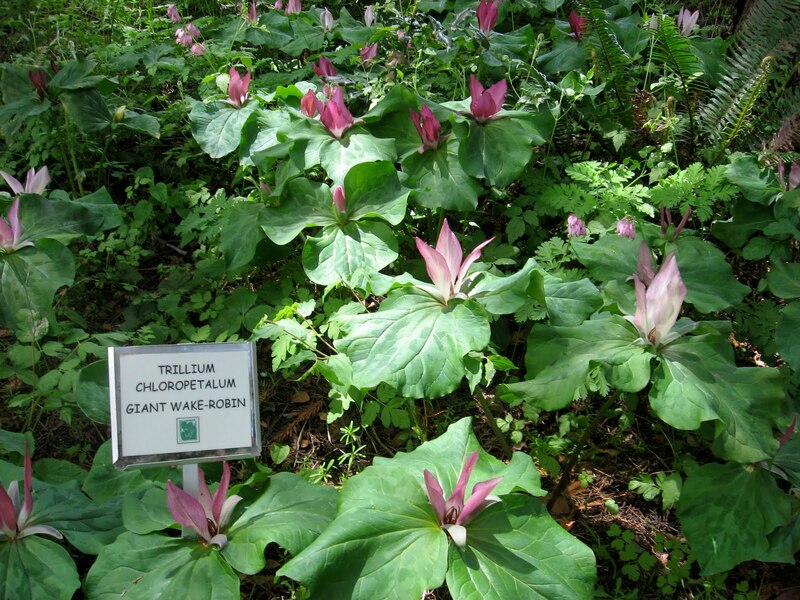 A patch of shade-loving Trillum. 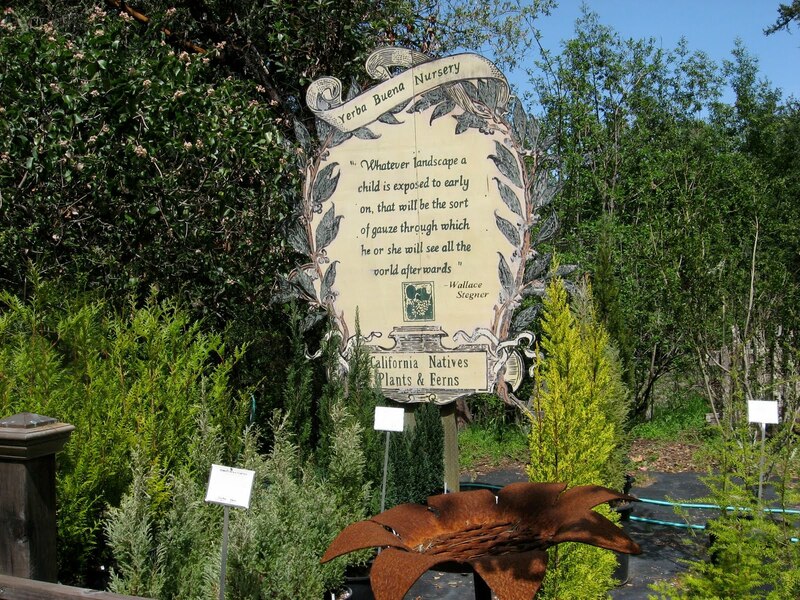 that we are repaid a thousand-fold by being enriched by their presence around our homes, and by creating balance in the garden ecosystem. The garden then becomes truly alive and thriving!